The majority liked how comfortable the New Balance 608 v4 was for everyday use. Many people appreciated the availability of wide-width variants. A good number of reviewers commented that the fit was perfect. Several users recommended using the shoe for cross-training because it was supportive. Some owners claimed that it relieved their foot pain. A few buyers adored its style. The lightweight nature of the trainer delighted a handful of consumers. Many people claimed that the construction of the 608 v4 was substandard because of its parts started deteriorating after a short period of use. Some buyers said that it lacked cushioning. A minority of users said that the size ran small. The long laces did not please a handful of testers. One person complained that the flex grooves caught dirt and cracked, causing water to seep into the shoe. 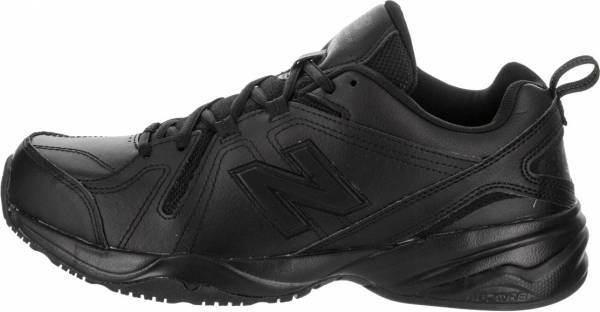 The New Balance 608 v4 delighted many consumers because of how comfortable, supportive, and stable it was to wear. It was also highly regarded as versatile footwear as it can be used for workouts, running sessions, casual walking, and work. People with foot issues claimed that it helped to relieve pain. Despite the praises, some buyers had grievances with the 608 v4 because of the early deterioration of some components, poor quality, and insufficient cushioning. But despite the complaints, a significant number of reviewers still found it to be a solid workout trainer. The New Balance 608 v4 is a cross-training shoe designed to deliver stability and comfort. It has been updated to offer more cushioning and support via its ethylene-vinyl acetate (EVA) footbed, injection molded EVA (IMEVA), and the full-length ABZORB cushioning. The combination of these materials provides a flexible yet non-compressing platform. These components have also been carried over to the more recent 608 v5 version of the shoe. The upper of this model is made of leather for support. At the back, it features a dual-density foam collar that keeps the ankle supported and the heel locked down. The bottom of the shoe is lined with non-marking rubber. This material is also durable and provides adequate traction to prevent slipping on floors. The New Balance 608 v4 comes in both men’s and women’s versions and runs true to size. The width is available in D - Medium, 2E - Wide and 4E – Extra-Wide for men, and 2A - Narrow, B - Medium and D - Wide for women. The New Balance 608 v4 employs a non-marking outsole that does not leave streaks on gym, studio or indoor court floors. The rubber compound is durable and flexible to accommodate the natural bending of the foot. It extends to the front of the shoe and serves to protect the toe area against abrasions. Flex grooves are found in the forefoot area. They add flexibility to the sole unit while the tread pattern increases the surface area to enhance traction of the rubber. The New Balance 608 v4 employs two technologies to deliver cushioning, the IMEVA and the ABZORB. The IMEVA is firm but has enough flexibility to accommodate the natural bending of the metatarsals. As for the ABZORB, it is a proprietary foam-based polymer that distributes the force from the point of impact and decreases the shock felt by the lower extremities. This full-length material works in conjunction with the IMEVA to deliver a supportive and comfortable base. The shoe also utilizes an EVA foam footbed. This material serves to cushion the impact as well as keeping the foot comfortable. EVA is lightweight, resilient and durable. In between the midsole and the footbed is an internal shank. It reinforces the arch area, making sure that the bending occurs in the forefoot area. This structure prevents injuries or pain in the middle of the foot. The shoe uses leather as the primary material to deliver structured support in the upper unit. The breathability and heat dissipation are ensured by the perforations and the mesh tongue. The collar features two foam structures for different purposes. The foam that comes in contact with the ankle is soft to prevent irritation while the other one is firmer and serves to support the ankle. The traditional lace-up closure uses round laces pass to keep the foot securely inside. The plush tongue has a slot on top of it where the laces are threaded and prevents it from moving out of place while in use. The trainer uses a Phantom Liner to cover the inside of the upper. It is a smooth and lightweight fabric that prevents chafing as it hides the seams of the foot chamber.